When permanent teeth are lost, regardless of the reason or number of teeth, dental implants can offer a "new lease on life." They are superior to other choices because they are solid, secure, and esthetic. After nearly 35 years of use, they have a 90-95% proven success rate in appropriately chosen cases. An implant is a special surgical grade titanium post, manufactured to highly precise specifications, under strict sterile conditions, that is inserted surgically into the jawbone below the gum surface. With proper use of the newest anesthetics and medications you need not be concerned about pain. As the bone bonds to the post, it forms a secure foundation onto which your new teeth are then attached and shaped to match your mouth. The number of teeth being replaced will determine the best kind of restoration for you. Dental implants can help replace a single tooth, or a full set of teeth. If you have been suffering with partial or full dentures, or are missing teeth, or feel you need teeth extracted, do not hesitate to call to be evaluated for implants. Dental implant supported tooth replacement is completed in two phases. The initial phase of treatment is done by an oral surgeon. In this phase, titanium implant posts are surgically positioned into the gum line. The procedure is fairly simple. The surgeon makes a small incision in the soft tissue and insert the implant post into the jaw. Once in place, the surgeon attaches a protective cap to keep the implant accessible until you heal. 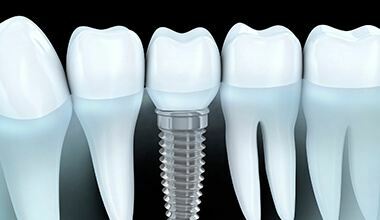 Over the course of three to six months, the dental implant fuses with the supportive gum and bone tissue, a process known as osseointegration, mimicking natural root structure. Following the osseointegration period, you’ll need to return to our office where we’ll attach your restoration. Patients missing between one and four consecutive teeth will more than likely need to have an implant supported dental crown or fixed bridge attached. Like traditional crowns and bridges, these tooth replacement prosthetics are crafted to look like the portions of the tooth visible above the gum line when viewed from the top. However, they are partially hollowed on the inside so they can be attached to the dental implant. 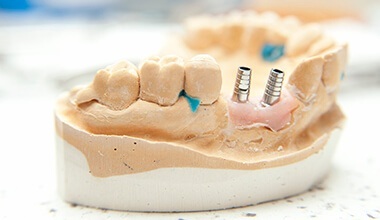 We start by placing a connective piece called an abutment onto the implant. Inside of the crown, there is another connective piece that keeps it locked into position anchored to the abutment. You will not be able to remove these tooth replacement prosthetic at home, but we can remove them in our office if need be. A single dental crown or two fused together in some cases can be supported by one implant post. Bridges that consist of three or more replacement teeth will need to be anchored to at least two implant posts, one on each end. Following more extensive tooth loss, our team may recommend a partial or full denture. Traditional dentures are crafted by attaching replacement teeth to a gum colored base. 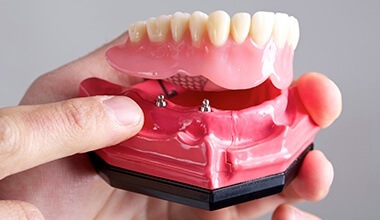 Partials are held in place with metal clasps connected to remaining healthy teeth, and full dentures are stabilized through suction between the denture base and gum line. Patients in need of an implant retained prosthetic will receive a partial or full denture that closely resembles the traditional prosthetic, but these dentures will be affixed to dental implants for support. The number of implants needed to anchor the prosthetic will depend on a variety of factors including the size of your jaw and the number and position of missing teeth. However, four to six implant posts is typically an adequate number to provide complete stability for dental implant supported dentures. We can offer both fixed and removable implant retained dentures to meet your needs and ensure maximum comfort. 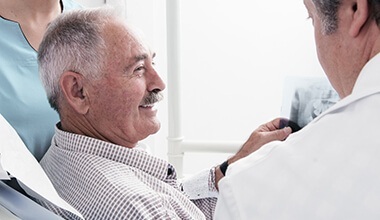 Patients who have experienced diminished jawbone density or who may not otherwise be considered good candidates for dental implant supported dentures can often successfully receive an All-on-4 restoration. All-on-4 uses four strategically positioned implant posts to offer the optimal level of stability by using the naturally denser portions of the jaw. Two implants are placed in the front vertically, and two implant posts are positioned diagonally supporting the back part of the denture while the implant is fused with the front of the jaw.